Prayagraj: The Yogi Adityanath government in Uttar Pradesh and the Centre have publicised the construction of over 1,20,000 toilets here on a large scale but their "Swach Kumbh" (clean Kumbh) -- claims have seemingly fallen flat as thousands of these were rendered non-functional on the very first day of the mega spiritual, cultural and religious congregation. "There is a special emphasis on cleanliness this time at the Kumbh Mela. People were compelled to defecate in the open due to absence of toilets in the previous years but this time 120,000 toilets have been built and double the number of sweepers will maintain cleanliness. 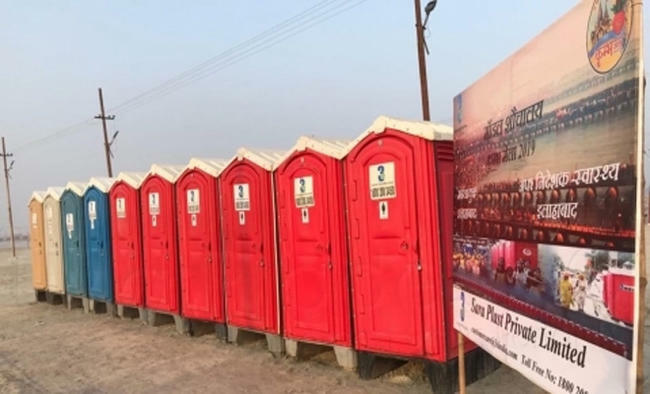 The last Kumbh mela had only seen 34,000 toilets," the Kumbh administration said in a press release.These claims are being aligned with Modi government's signature Swach Bharat campaign and are being publicised extensively in advertisements, on hoardings here, as well as the media. However, on the very first "Shahi Snan" (royal bath) that took place on Tuesday on the occasion of the auspicious Makar Sankranti, dozens of visitors could be seen defecating and relieving themselves in the open.Several such sights were witnessed in close proximity to the Sangam -- the confluence of Ganga and Yamuna rivers and the mythical Saraswati -- which is where the devotees are headed to take the holy dip.Why such a state of affairs despite Rs 4,200 crore of public money being spent for the Kumbh Mela -- the costliest ever -- by the UP government? The presence of toilets all across the by-lanes of the city as well as near the bathing ghats is a welcome sign but most of them had turned non-functional due to shortage of water or being filthy, uncleaned as they are, on Day 1 of the fair. The plastering and cementing in several toilets has also eroded, making them completely non-functional.According to officials about two crore devotees took the holy dip on the opening day but the official figures were contested by many. Much to public dismay, thousands of toilets failed to serve their purpose after the use by a handful of people. The reasons are unavailability of water, lack of cleaning staff, and an apparent failure in planning.For instance, a vast majority of poor devotees, coming mainly from rural regions of the country, are headed directly to the bathing ghats. But the number of toilets in these areas are far lesser than those in the by-lanes of the city. Additionally, the cleaning staff complained that they were handed over multiple tasks such as cleaning the toilets, sweeping the floors and even chasing the stray animals simultaneously. In doing one thing, they missed the others, they complained.Responding to an IANS query, Rajeev Rai, SDM Kumbh, admitted that there had been "a problem" and that they would be taking "corrective measures" to ensure cleanliness and hygiene on other significant dates that are expected to draw large number of devotees. "I admit that toilets are not upto perfection in some regions but we are taking corrective measures. If need be, we will change the contractors," Rai said, adding that all preparations were made in barely one month time.Locals suggested that instead of focusing on large numbers, the administration could have done better by ensuring cleanliness in even half of the existing number of toilets.They pointed to the apathy of general Indian consciousness towards hygiene. "If there is one toilet and several people are to use it, they will all be cautious to leave it clean for the next user. But here we have a situation where there were more toilets than visitors arriving at the start. So nobody bothered and when toilets were actually required by public, they were too dirty to use," said one localite Himanshu Mishra.For all the government claims, much more attention and planning was required for the much-hyped, albeit non-functional, toilets built for devotees gathering here from all over the country.